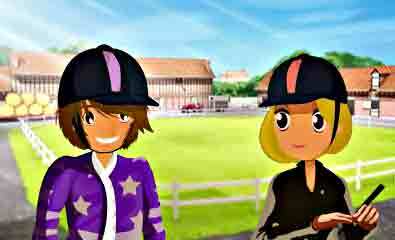 Tags: Feed your horse, Grooming, Horse jumping, Mini-games, Stable, Take care of horses, Train horse. 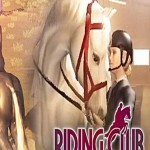 Have some fun with you horse participating in a lot of activities with it! 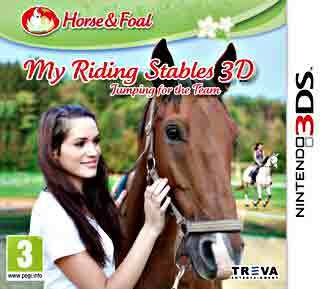 This game is a sequel of “My Riding Stables 3D: Rivals in the Saddle", so if you played the previous one you’ll most likely like this one too. In Jumping for the Team you play as a stable owner that is struggling to keep it open. It isn’t easy and you have some problems with money so prepare yourself for a hard job! The story of this game it’s really cute and it teaches you to overcome your difficulties with a little help of your friends. I really liked the message that this game gives, it is very positive. 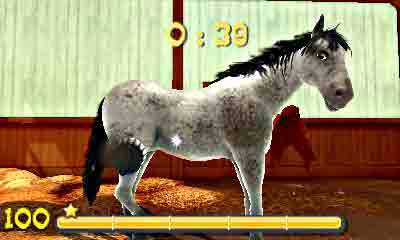 In the game itself, you have some pre-selected horses but you can create some of your own by selecting one of the 26 breeds available and then you can follow these horses’ development until they become professionals in the competition world. Along the way, you’ll have to manage everyday chores like brushing your horse and giving it food. And I have to say, I had a blast doing this. Why? 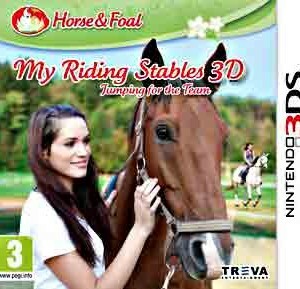 Well, it uses the gyroscope system of the Nintendo 3DS, which means that it actually feels that you are in the stable with your horse and that the movements that you make actually affect your action. Pretty cool right? In your journey to save the ranch, you’ll get instructions from several other coaches, which is a great way to learn how to play the game. 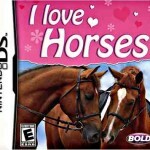 There’s also the possibility to take your horse outside and make several activities with it. One of the coolest is training him. You have a rope and you need to guide, but here comes the cool part: you do this with the gyroscope, which means that you have to spin around yourself in order for your horse to make the same. 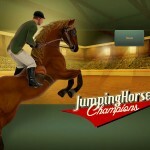 Each time you successfully complete a task, you earn experience points that help the horse to become a professional. These tasks are graded from D to A+ so make sure you’ve done the best performance. Each time one of your horses reaches the professional level, it is sold. 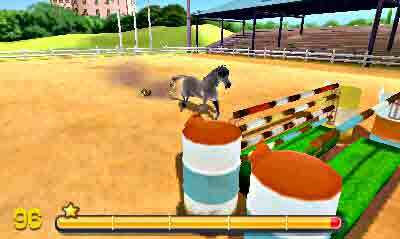 You’ll also find 13 mini-games where you can have fun with horses while training them. Some of these activities include shooting arrows with a bow and jumping over obstacles. Although there is some variety, this ends up being a bit repetitive after a while.